Well well well, look who's putting on fancy new duds for 2016! Talk about a major switch! 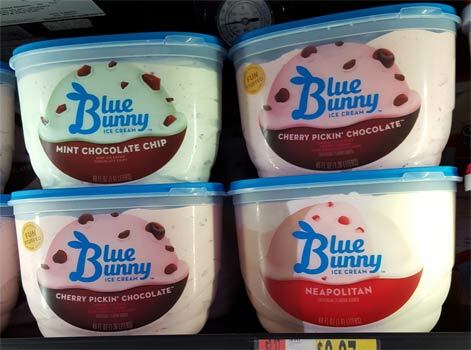 If you think about it, you really only see the clear container trick on gelato, but Blue Bunny has got themselves a new logo and a very clear housing. Nick saw it on Friday and then I saw it on Saturday. Be on the look out and let us know when it starts popping up in your area. Oh, let me apologize for the slim pickings of new reviews right now. In general, The Impulsive Buy readers are killing us on finding new stuff before we do. In particular, Massachusetts got slammed with a snowstorm today and not only did I not go ice cream hunting and have to shovel and snowblow instead, but we lost power for over three hours. The good news is the ice cream stash seems ok. I would have been kind of bummed if I didn't get to second scoop Cake My Day and I would have been really bummed if I lost my second quart of Perry's One Buffalo. Alright, have a good weekend everyone! Can you review more Trader Joes ice cream? I do try to keep up with what's new for ice cream at Trader Joe's, but I'm just not very good at remembering to try their stuff overall. That said, I will do my best to keep it in mind. Sorry to hear you all got whacked with this snowstorm Dubba! We got a little over 30 inches over two weeks ago and by some miracle didn't lose power. My first thought was to be so grateful not to be freezing in my apt and the second thought was to be happy my ice cream wouldn't melt. I hope things calm down soon and that you and Nick are able to get your hands on some of the new products. I'm really looking forward to your reviews of the new B&J's dairy free flavors; especially the coffee one. It's in Walmart and it IS QUITE A BIT LESS ICECREAM FOR THE SAME AMOUNT OF MONEY. wE BUY SUGAR FREE. Well...Now I just feel less guilty when I buy the more expensive ice cream because blue bunny has just closed the gap on their price per ounce. Here in FL I saw about a 50¢ increase in their 56oz containers of ice cream approx. 1 year ago. This resulted in my purchasing of another brand more often, and while more expensive, it's a full 1/2 gallon of ice cream! I like blue bunny ice cream but when I saw the re-branding with the clear containers the very first thing I looked for was to see if the size of the container got smaller, and it did. Did they really think we wouldn't notice? Well maybe they'll notice a drop in their profit margin when people such as myself begin buying other brands of ice cream more often. 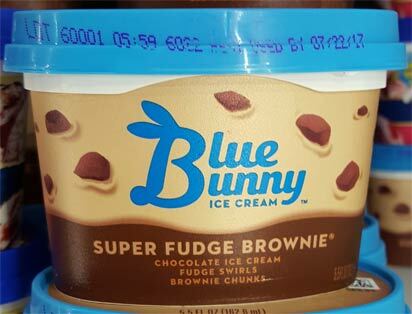 Blue Bunny ice cream is great, but certainly not the best (in my opinion), and with another increase in price per ounce of their ice cream some of the other brands are becoming even more enticing to purchase more often. Whatever their reason, I don't think it was a very smart business decision because as another poster stated, "it IS QUITE A BIT LESS ICE CREAM FOR THE SAME AMOUNT OF MONEY". Turkey Hill put out a good post a few years ago about the battle to keep ice cream at the same price by reducing the size or by raising the price and keeping the size. It was all about everything else going up so it has to go up too (think about how cheap milk and bread use to be). anyway, which brand still does half gallons? No one around here does so I am curious. Thanks! I saw the new packaging at my local Walmart yesterday. The price remains the same, but the new packaging contains less ice cream. In fact, there's TWO CUPS fewer, based on the nutritional information printed on the new packaging. That translate to a price increase of almost 15-percent, based on weight. I don't mind paying for quality and I don't mind if a company feels the need to increase prices for whatever reason. However, I am hopping mad like a bunny when a company feels the need to use such dirty tactics to trick consumers like this. 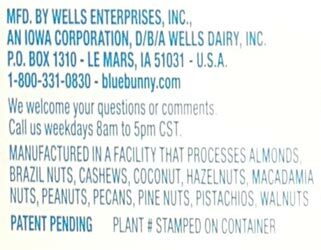 My family has been enjoying Blue Bunny ice cream for over 11 years and we will stop buying Blue Bunny as soon as Walmart's stock of the old packaging runs out. @Kiersten: The thing ice cream companies know is that we are more fixated on price then we are on quantity. Remember, when they went from 64oz (half gallon) to 56oz, we all got frustrated, but nobody stopped buyy ice cream, at least not long term. Same here. We've lost (2) 1/2 cup servings, but long term, I don't see it making a huge impact in my blue bunny purchases. The only thing that might change is that I would keep a better eye out for sales (not that walmart does that with ice cream, but other stores do). If the quality goes down or the chemical/gum ratio goes up, then that will make me stop buying. You're absolutely right! Ice cream manufacturers are almost like drug dealers. :) They know we're hooked on their product. :) I may complain about prices for a few weeks, but in the end, I will most likely give in and buy Blue Bunny ice cream no matter what. They are now the most expensive ice cream at my local stores, outside of Ben & Jerry's. Whereas they used to be a great deal at 1.75 quarts, they have shrunk down now to 1.36 q, and the price I saw was $4.49. I hope they don't get away with their rip-off re-branding scheme. Lots of great ice creams out there, with reasonable prices, in 1.5 q containers. Let's all support them instead!! @Dave: Blue Bunny is (almost) the last to go to the 1.5 quart size. I know it's annoying and frustrating, but it's not unheard of. Inflation is inflation. I wonder how much blue bell costs as they are the last 1/2 gallon hold out. Complete BS! I love the ice cream but wow, they just continue to make smaller packaging and charge you the same amount of money. One thing that I did notice is that it does not save premium anywhere on the packaging anymore. I wonder if they have change the ingredients? Kind of hard to tell with the mint and chip but I will definitely notice when I try the vanilla bean next time. If it has changed, they definitely have lost a customer. Nothing beats a good quality. 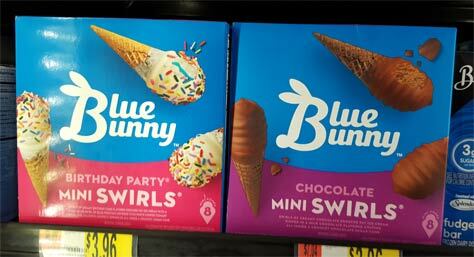 I recently started seeing several new flavors of Blue Bunny ice cream in their new packaging. OMG, I don't know what they did but it's amazing! Love the really creamy texture. I have 3 different flavors in my freezer right now. Move over Edys's, theres a new bunny in town. As for the 48 oz size, take a look at every other brand of ice cream, they are all 48 oz sizes now and the prices all remained the same. Same with dog food, tuna, etc. Everyone is shrinking the size but not the price. Their regular vanilla flavor now taste more chemically and more airy and less creamy than before when they had their old packaging. Has anyone noticed this difference?